Approximately two-thirds of all uranium is mined in one three countries: Australia, Canada, or Kazakhstan. Kazakhstan is, by far, the largest producer of uranium, accounting for about 40 percent of global production. It should not be surprising, then, that five of the ten biggest uranium mines are located in the Central Asian country. A highly concentrated industry, in 2014, eleven companies sold nearly 90 percent of the world's uranium mine production. According to the World Nuclear Association, in the same year, over 56,000 tons of uranium was mined worldwide. The ten largest uranium mines contributed over 36,000 tons or nearly 65 percent of this total. The list below is compiled from World Nuclear Association statistics. Each mine name is followed in brackets by the country it is located within, as well as the company (or companies) that operate the mine and the mine's 2014 output in tons of uranium (tU). 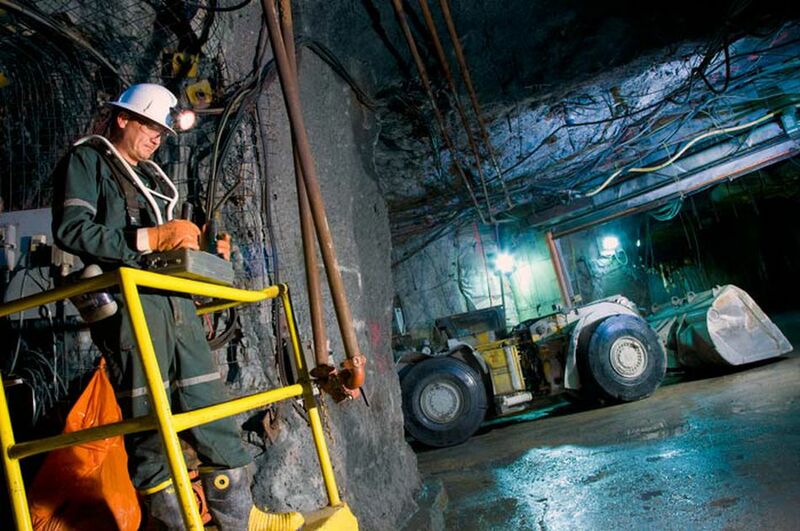 Producing 13 percent of all uranium mined in 2014, the McArthur River mine is located in the Athabasca Basin of northern Saskatchewan, Canada. The McArthur River mine is 70 percent owned by Cameco - who also operates the mine - and 30 percent owned by French-based Areva Resources. Production at McArthur River began in 1999 and the mine has an average ore grade of nearly 11 percent (U3O8) - over 100 times the world average. McArthur River mine employs over 1,300 people and is licensed until 2023. The Tortkuduk & Myunkum mines in southern Kazakhstan are owned and operated by the Katco joint venture. This joint venture is made-up of French-based Areva (51 percent ownership) and Kazatomprom (49 percent ownership), Kazakhstan's state-owned uranium company. Tortkuduk & Myunkum is the largest uranium mine in the world to operate using in-situ recovery techniques. This process involves injecting the ore with chemical solutions that allow uranium ore to be pumped to the surface for processing. As a result, no tailing or waste rock are produced. The Olympic Dam mine is a poly-metallic mine located in South Australia and operated by BHP Billiton. As well as being one of the biggest copper mines in the world, Olympic Dam is also a major source of uranium, gold, and silver. Production at the underground mine began in 1988, while major expansions were completed in 1997 and 1999. Proposed open-pit expansions, which could have tripled uranium output, were postponed in 2012 due to the prevailing market conditions. Created in 1968, SOMAIR (Société des Mines de l'Air) is a joint venture between Areva (63.6 percent) and Niger's state agency for the management of mines (36.4 percent). Uranium is mined by SOMAIR at several open-pit locations in northwestern Niger, near the city of Arlit. The average grade of processed ore is 2.8 percent uranium. The company has approximately 950 employees. Budenovskoye 2 is Kazakhstan's second largest uranium mining operation, accounting for just over 2,000 tons of uranium in 2014. Operated by a joint venture between Kazatomprom and Canada-based Uranium One - both of which have 50 percent stakes in the JV - the mine is located in southwestern Kazakhstan. Like Tortkuduk & Myunkum, Budenovskoye 2 operates using in situ recovery technology. Uranium production at the mine began in 2009. Another joint venture between Uranium One (70 percent stake) and Kazatomprom (30 percent), South Inkai also began production in 2009 in the southern region of Kazakhstan. The production capacity at South Inkai is limited to 2,000 tons of uranium per year and, as with other Kazakh uranium mines, in-situ recovery techniques are used. Founded in 1968, Priargunsky Industrial Mining and Chemical Union (PIMCU) is Russia's largest uranium mining company. It operates five underground mines and a hydrometallurgy plant in the country's Trans-Baikal Territory. All uranium produced by Priargunsky is consumed by Russia's domestic nuclear industry. The company's largest shareholder is JSC ARMZ, which also purchased 100 percent of Uranium One in 2013. The Langer Heinrich mine is located at the base of the Langer Heinrich Mountain in Namibia's western Namib Desert. Until 2013, Rio Tinto's Rossing mine was the country's largest producer of uranium. However, while uranium output at Langer Heinrich has been stable at around 2,000 tons per year since 2012, output at Rossing has declined from over 3,000 tons in 2008 to just over 1,300 tons in 2014. Owners of Langer Heinrich mine, Paladin Energy acquired it in 2002. Production commenced five years later. In 2014, a 25 percent stake was sold to China National Nuclear Corporation (CNNC). The Inkai Uranium Project is a joint venture between Canada's Cameco (60 percent) and Kazakhstan's state uranium company Kazatomprom (40 percent). Commercial production at the in-situ facility began in 2009, while the main processing plant was commissioned in 2010. At full production, the operations at Inkai employs around 500 people. Located in the northern Chu-Sarysu region of Kazakhstan, the Central Mynkuduk mine is operated by the Ken Dala joint venture, an agreement between Kazatomprom and Stepnogorsk Mining-Chemical Complex. The mine began production in 2007 and hit full output of nearly 2,000 tons in 2010.